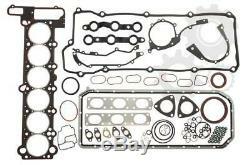 FULL ENGINE GASKET SET AJUSA AJU50147500. BMW 3 (E36), 5 (E39), 7 (E38), Z3 (E36) 2.5/2.8 01.95-11.01. 323 I 2.5 170 HP M52 B25 (256S3). 328 I 193 HP M52 B28 (286S1). 323 TI 170 HP M52 B25 (256S3). 323 I 170 HP M52 B25 (256S3). 528 I 193 HP M52 B28 (286S1), M52 B28 (286S2). 523 I 170 HP M52 B25 (256S3). 728 I, IL 193 HP M52 B28 (286S1), M52 B28 (286S2). 2.8 I 193 HP M52 B28 (286S1). We use UPS and standard post office service. The item "FULL ENGINE GASKET SET AJUSA AJU50147500" is in sale since Monday, March 26, 2018. This item is in the category "Vehicle Parts & Accessories\Car Parts\Engines & Engine Parts\Gaskets & Seals".sta" and is located in Skarzysko Koscielne.